Anne M. Barger, DVM, MS, DACVP, is a clinical associate professor in the veterinary diagnostic laboratory and section head of the clinical pathology laboratory at University of Illinois. Her research interest is cytology, particularly immunocytochemistry and osteosarcoma. Dr. Barger is an active lecturer on the topic of cytology; she received her DVM and MS from University of Illinois. Abrams-Ogg ACG, Lim S, Kocmarek H, et al. Prevalence of antinuclear and anti-erythrocyte antibodies in healthy cats. Vet Clin Pathol. 2018;47(1):51-55. Diagnosing immune-mediated diseases can be difficult in all species but can be particularly challenging in cats. Patients with systemic lupus erythematosus produce antibodies directed against molecular structures from the nucleus, cytoplasm, and cell membranes. These autoantibodies form immune complexes that can damage cells and interfere with cellular physiology. Clinical findings can include a broad range of signs (eg, fever, nonerosive arthritis, renal disease [primarily glomerular], skin lesions, CNS disorders). Fever and skin lesions are the most commonly identified clinical abnormalities in cats. Antinuclear antibody (ANA) testing has shown that 16% to 20% of healthy dogs or dogs with other inflammatory diseases will have a positive test result.1 The prevalence of positive results in healthy cats, however, has not been clearly established. This study sought to determine the prevalence of positive ANA test and direct antiglobulin test (DAT) results in healthy cats. Sixty-one client-owned and 28 facility-owned cats were included. Of the 61 client-owned cats, 20% had strong ANA titers and 10% had weak ANA titers. Of the 28 facility-owned cats, only 4% had weak titers; no cats in this group had a strong titer. The DAT, or Coombs test, is commonly used in the diagnosis of immune-mediated hemolytic anemia (IMHA). This species-specific test detects immunoglobulins and complement bound to patient RBCs. In cats, a negative DAT result has infrequently been identified in patients with IMHA, but a positive DAT result has been identified in cats with other inflammatory diseases such as pyothorax, pancreatitis, and FeLV.2,3 The present study showed that a low percentage of all the healthy cats were DAT-positive at a low dilution (1:2). These findings illustrate that healthy cats may have positive ANA or DAT results, but the prevalence of strong reactions is low. Similar to ANA testing, the DAT is not a stand-alone test and should be interpreted as part of a panel of tests, which should include CBC, and clinical suspicion of hemolytic anemia. A positive DAT result may be seen in cats with inflammatory diseases other than IMHA (eg, pyothorax, pancreatitis, FeLV). Gershwin LJ. Antinuclear antibodies in domestic animals. Ann N Y Acad Sci. 2005;1050:364-370. Ottenjann M, Weingart C, Arndt G, Kohn B. 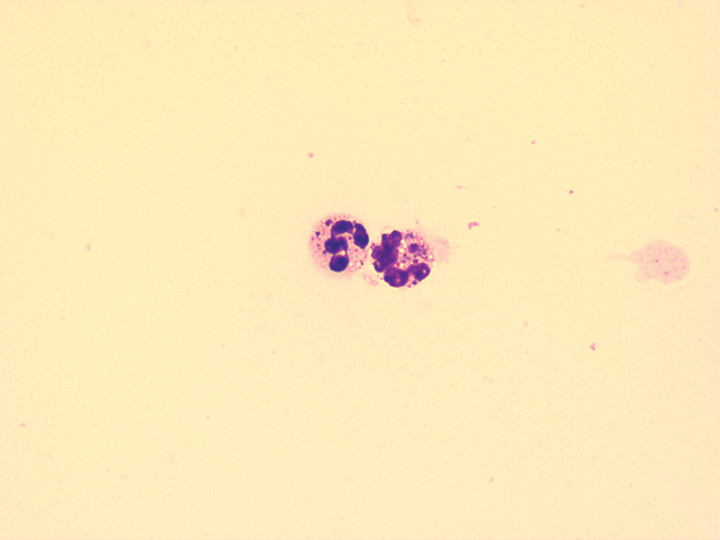 Characterization of the anemia of inflammatory disease in cats with abscesses, pyothorax, or fat necrosis. J Vet Intern Med. 2006;20(5):1143-1150. Wardrop KJ. Coombs’ testing and its diagnostic significance in dogs and cats. Vet Clin North Am Small Anim Pract. 2012;42(1):43-51.